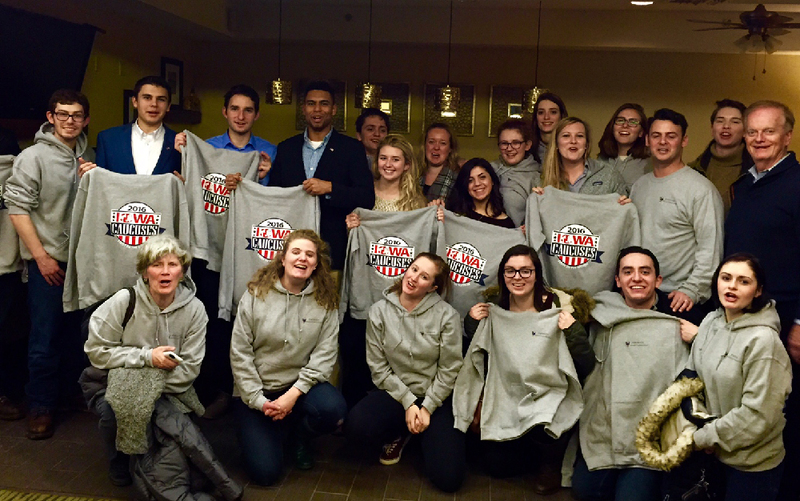 Last weekend, 19 students flew to Ames, Iowa, to get a firsthand look at the campaign trails of various candidates and witness Monday’s caucus, in which Ted Cruz beat stiff Republican competition while Hillary Clinton edged out a narrow victory over Bernie Sanders. At least 40 students will head to New Hampshire this weekend to observe the primary elections there. The trips were organized by the communication studies department. Certain classes and organizations are sending groups of students, but people from any major had the opportunity to apply. Trips like these have been standard for the department every four years since 2000. These groups are the largest Emerson has ever sent to Iowa and New Hampshire, according to Spencer Kimball, a senior scholar-in-residence in the communication studies department. This is an experience students can only participate in once during their college careers, due to the election cycle. During these trips, students participate in a variety of activities related to their majors and to the general campaign season, Kimball said. Journalism students practice their reporting skills, political communications majors volunteer to help in the campaigns of certain candidates, and everyone attends general events like rallies and speaker presentations. In Iowa, everyone that travelled there attended a caucus on Monday evening. In addition, students meet most of the major candidates face to face. Elias Romanos, a junior political communication major, went to Iowa and will go to New Hampshire this weekend. “I’m in a couple of classes about political campaigns, but I’m curious to actually see how they put it together,” Romanos said. Connor Dane, a sophomore political communication major, recently returned from Iowa, too. Dane worked on the Massachusetts gubernatorial campaign of Martha Coakley in 2014, and says he wants to see politics on an even larger scale. At a rally for Republican frontrunner Ted Cruz on Sunday, sophomores Kenzy Peach—a performing arts and political communication major—and Arden Jurskis—a visual and media arts major—faked a marriage proposal. Jurskis got down on one knee as Cruz neared the pair, and asked Peach to marry him. Cruz was thoroughly convinced, and a picture of him applauding while Peach and Jurskis hugged in front of him quickly circulated the internet, appearing on media outlets like Reuters, Yahoo!, and The Guardian. Peach said it was a spontaneous decision that began with an unofficial contest to see who could get the best selfie with a candidate. She said they didn’t intend it to go viral. According to Peach, the reaction from the Emerson community was mostly positive, with some exceptions questioning the students’ professionality. Kimball said the communication studies department plans to send students to the Republican and Democratic national conventions this summer. Deputy News Editor Katherine Burns, who went on the Iowa trip, did not edit this article.